Ready to rock out? The Sesame Street LET'S ROCK! Elmo Guitar lets your child take center stage and put on a rockin' performance. Packed with fun, interactive features, this guitar includes three preschool tunes, three modes of play, light-up keys, and a whammy bar. The Sesame Street LET'S ROCK! Elmo Guitar gives kids the option of playing built-in songs or creating their own music so they'll be ready to hit the big time in no time. Elmo "magically" knows when you have the LET'S ROCK Elmo Guitar and plays along with you to the Elmo's World song! Preschoolers can put on a rockin' performance with the LET'S ROCK Elmo Guitar! 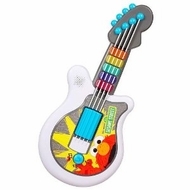 Guitar includes three preschool tunes, three modes of play, light-up keys and a fun whammy bar!